To ring in the new year and all its resolutions, you’re invited to a special workshop that combines personal and professional growth strategies. Join us for a discussion on the various benefits of reflection and journaling in the pursuit of excellence. 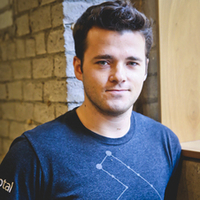 Toptal developer John De Mott is also the creator of Bliss, one of the most popular gratitude journaling apps in the Android store. John will share the inspiration that led him to create Bliss, and other backstory behind the app and how it became a success. Feel free to bring your own story of how journaling or reflection has helped you, personally or professionally. This is a great opportunity to gain some motivation that will help you reach new goals in 2019. Please RSVP on this page to give us an accurate headcount. For questions, contact Ethan directly.